A cause of action for a premises liability claim originates from an injury to a person on the property of another. Generally, an owner of property owes a duty to his/her guests ("invitees") and in some cases, other persons, to keep his/her property in a reasonably safe condition. You must establish that the property owner owed a duty to you, that the duty was breached, and that the breach proximately caused your injuries. Premises liability is a broad term which covers the methods or ways by which one owns or controls a “premises.” The liability stems from the manner in which the ownership or control is exercised. Premises can generally be thought of as land, home or building. The law in Georgia regarding premises liability centers on whether the victim is an invitee, a licensee or a trespasser. An invitee would be a person that the owner or occupier of the premises expressly or impliedly invites upon his/her land such as a customer or servant. An invitee could be a customer at a fast food restaurant or a babysitter. In contrast, a licensee is a person that is neither a customer, servant or trespasser who is permitted upon the premises of another for his/her own interests or convenience. Under Georgia law, an invitee enjoys a much greater protection from injury or harm as the owner/occupier owes a duty of ordinary care to the invitee in keeping the premises and approaches safe. In contrast, an owner or occupier is only responsible to a licensee if the injury was willful or wanton. The determination of whether a victim is an invitee or licensee is complicated and would require the legal expertise of an attorney experienced in premises liability. Suffice it to say, there are numerous and sometimes conflicting decisions from the courts in Georgia regarding these very issues. Without a doubt, the majority of premise liability cases in Atlanta and throughout Georgia is slip and fall cases. Many of these cases involve “…persons who slip, trip, flip, stumble, tumble, step, mis-step, slide, glide, skid, drop, lurch or otherwise lose their footing and fall on the premises of another.” Cynthia Trimboli Adams and Charles R. Adams III, Torts, 44 Mercer L. Rev. 375, 382-83 (1992). 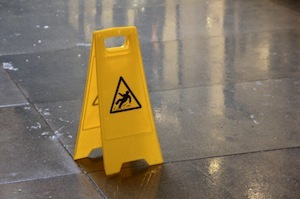 The three (3) categories of slip and fall cases are foreign substance cases (water, oil or other substance on the ground), static defect cases (structural defects such as uneven stairs, cracks in sidewalks and unlevel walking surfaces) and ramp cases. Many slip and fall cases occur in grocery stores, garden stores and the like. Generally, an owner is allowed a reasonable time to inspect and keep the premises safe. Some case decisions in Georgia have stated that an owner has fifteen (15) minutes to discover and clean up the foreign substance. To recover and be compensated for your slip and fall injury in Atlanta and throughout Georgia, you must show (1) that owner had actual or constructive knowledge of the hazard and (2) that the victim lacked knowledge of the hazard. There are numerous court decisions that are fact specific to the slip and fall claims in Atlanta and throughout Georgia which is why you should contact Kevin C. Ford, an experienced attorney in premises liability, to review the facts of your slip and fall with you. Nightly newscasts reflect that crime in Atlanta and surrounding areas is on the increase and the statistics do not lie. The rise in crime has also accounted for the rise in lawsuits by victims seeking to hold business owners responsible for crimes that occurred on their property. The central issue in negligent security cases in Atlanta and throughout Georgia is whether or not the property owner had superior knowledge of the danger that hurt or injured the victim. These cases are termed negligent security cases. Generally speaking, Georgia law has held that the property owner is not liable for the criminal or negligent act of another. This general rule was in place from the early years of Georgia case law. However, there are exceptions to this general rule and the exceptions and the corresponding case law in Georgia has been growing at an exponential rate. The main exception to the rule is that the criminal act was foreseeable. Victims of crimes have tended to establish that the crime was foreseeable by showing evidence of prior similar crimes on the property. What constitutes a prior similar crime is the topic of debate and leads to numerous court decisions that are sometimes fact specific. Premises liability and negligent security cases are generally fact specific and complex. The Law Offices of Kevin C. Ford is currently accepting premises liability and negligent security cases throughout Georgia. Please contact us today for a free evaluation and consultation.